For the last few days, Hillary Clinton has been pushing a new campaign theme where she claims to have “crossed a threshhold” for becoming Commander in Chief of our military, while implying that Barack Obama has not. The outrageous part is that each time she does this she assumes that Republican John McCain has crossed that threshhold as well. So, in effect, she is endorsing McCain’s bid for the presidency over Obama’s. Hillary has crossed a threshhold alright! Right into Joe Lieberman territory. What’s next? Will she be making a nomination speech at the Republican National Convention this summer like Zell Miller did? I’m not a Hillary basher by any measure. I’ve always admired and supported her in the past. But lately it is becoming extremely difficult for me to defend her actions to my friends. What is going on? Hillary is not stupid. I know that she can count. I know that she can see the writing on the wall. As Jonathan Alter pointed out in Newsweek, she has no chance of catching up to Obama in the pledged delegate count at this point, even if she were to blow him out in every contest from here on out. So what is her gameplan with this new line of attack? How does she expect to win over Democratic voters by praising John McCain? It’s nuts. Is she just being vindictive, with the idea that if she can’t win, then nobody can win? It seems like just yesterday that I was celebrating Ciro Rodriguez’ victory over Henry Bonilla in the 23rd Congressional District. Now, it’s time to gear up for the next challenge. Bexar County Commissioner Lyle Larson won the Republican primary the other day and will take on Ciro this fall. Larson handily defeated millionaire businessman Quico Canseco despite being outspent nearly 10-1. I was glad to see Larson win, partly because I think he is not as noxious as Quico and partly because he does not have the personal wealth and financial resources at his disposal that Quico has. Larson seems like a mainstream Republican who is not out on the wingnut fringe. But then, I thought the same thing about John Cornyn before he got elected to the Senate. On his campaign website, Larson seems to downplay (or ignore) the more divisive issues on his website and promises to “bring fiscal discipline to Washington, D.C.,” secure our borders and care for our veterans. Hardly controversial ideas. Still, Larson covers his right flank by declaring "I am pro life and I value the sanctity of every human life.” and "I believe in traditional marriage; a union between a man and a woman". But then he goes on to emphasize his support for adoptions programs which everybody supports. But there are some worrisome areas on Larson’s “issues” page that voters should be aware of. He talks about Social Security in alarmist terms and hints that “tough decisions must be made” about the level of benefits younger generations will recieve. And on taxes, Larson embraces the nutty “Fair Tax” scheme most recently promoted by Mike Huckabee that would eliminate the IRS and fund the entire U.S. government (inadequately) with a massive 36 percent sales tax on everything. The goofy idea was initially dreamed up by the Church of Scientology, and is now being endorsed by the rightwing fringe of the Republican Party. One issue that Larson skirts on his web site, not surprisingly, is the Iraq War. But one can be assured that as the Republican candidate on the ballot with John McCain next fall, Larson will have no choice but to wear the Iraqi albatross around his neck. This should be a good year for Democrats and Ciro should not have too much trouble getting re-elected after knocking off Bonilla by a 55-45 margin less than two years ago. But he needs to take the challenge from Larson very seriously with the understanding that Larson or someone like him will be back again and again trying to pry him out of this newly blue congressional district. I am deeply disappointed in the elections results last night. I very much wanted to see Texas go for Obama. We had a chance to pick the next president of the United States here in Texas the other day and we blew it. The election results, which gave a slim popular vote victory to Hillary Clinton and a caucus-driven delegate victory to Barrack Obama, only served to muddle things up and send the whole campaign packing down the road for the next states to decide. Hillary is claiming a huge victory for herself, which is understandable, but when the delegates are all counted and divvied up there is less there than meets the eye. Hillary won big in Ohio and Rhode Island, but lost in Vermont. In Texas, she split the primary delegates and lost the caucus delegates. The final tally looks like she may end up with a net gain of two or three delegates, maybe. In other words, she did nothing to make up the gap in pledged delegates between her and Obama which stands at something like 157. So now, instead of bowing out of the race and allowing Democrats to regroup around their eventual nominee, we are going to continue the bloody fratricide to the delight of the Republicans for the next six weeks. Hillary’s only chance of winning the nomination will be to continue her negative campaigning and tear Obama to pieces before the Democratic convention this summer so that the super delegates will be more willing to abandon him and support her. The part of John McCain will now be played by Hillary Clinton for the next six weeks. Meanwhile, McCain will have time to raise a huge warchest with which to beat Democrats over the head this fall. I don’t know if I have the stomach to put up with this for another six weeks. Yech! 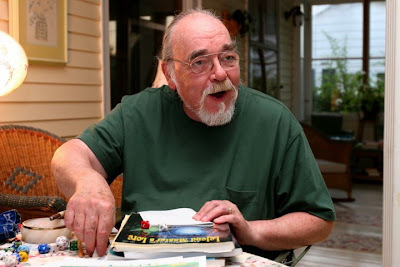 Gary Gygax, the creator of the Dungeons and Dragons role playing game, died today at age 69. I actually got to meet Mr. Gygax back during the summer of 1983 and got his autograph when I attended the GenCon gaming convention in Lake Geneva, Wis. with my friend Jim Miller. My friends and I were big into D&D when I was in high school. My friend Robert introduced me to the game when I was a freshman or sophomore and we played pretty regularly until we all left for college. D&D has gotten a bad rap over the years from fundamentalist churches and that lame TV movie that starred Tom Hanks and so forth, but I have to say that for a kid growing up in small-town South Texas it was a godsend. Back before we had home computers and VCRs and cable TV, there just wasn’t much for young teens to do in the evenings. Rather than driving around town, cruising the local Dairy Queen, drinking beer and generally getting into trouble, my friends and I would gather at someone’s house, sit around a card table with a big bowl of popcorn and play D&D until late in the evening. The game was complex and had lots of rules, but was otherwise very low-tech and required little more than the rule books, some pencils, paper and special dice. When we started, we didn’t even have dice and had to use little cardboard chits with numbers that we would keep in styrofoam cups. I remember when we finally got the special 20-sided, 12-sided and 8-sided dice it was very exciting. Back then, finding D&D games and accessories meant searching through the back corners of old hobby shops that mostly catered to people who built models and train sets. The closest one to us was in Kingsville more than 30 miles away. Today, the game has been taken over by computers. Whereas it used to require gathering all your friends together to play a decent game, you can now play all by yourself in front of your computer, sometimes with other people half a wold away sitting in front of their computers. It’s just not the same. I still have all my D&D books and stuff at home, packed away in a closet somewhere. Maybe when my kids are old enough and if they show any interest I might drag it all out and hopefully the magic will still work at that point. All it takes is a little imagination. I got an email today from Move-On.org that said they had called more than 400,000 Texas voters over the weekend to urge them to vote for Barack Obama. If they called everyone of them a dozen times like they did me, that would be a lot of phone calls! Seriously though, my phone was ringing off the hook all weekend by people calling on behalf of Obama. I never got any calls from anyone supporting Hillary. My wife assumed it was because I had given the Obama people my contact info when I dropped by their HQ last week to pick up a bumper sticker. But I didn’t tell them my name or anything. I just shook the guy’s hand and said thanks for the bumper sticker. So I assume they have my number from the Democractic Party which should be available to Hillary as well. On a related topic, I was listening to the local wingnut radio station again last Friday and the locally-based host - Joe Pags - was having a “townhall meeting” on the air with representatives from the different political campaigns taking questions from a studio audience. What I thought was incredible is that they had a well-known educator and labor leader there to represent Hillary, a prominent local state representative to represent Obama, a local attorney speaking for Mike Huckabee, but nobody to represent John McCain! How could that be?? This was the rightwing radio station that airs non-stop rightwing hate radio day and night and they couldn’t get a McCain supporter to show up for their big election event? How pathetic! And then I noticed that every single person in the audience asking questions throughout the show was an Obama supporter. Hilarious! I almost felt sorry for the host. I’m now hearing that Obama will be back in San Antonio on Tuesday as the election results are coming in. If he doesn’t win, I will be sorely disappointed because it will mean six more weeks of Hillary continuing to tag team with John McCain in attacking Obama, even though she still won’t be able to catch up to him in the delegate vote. One prominent blogger has already speculated that the Hillary team might even work to defeat Obama in November so that they can be set to run for president again in 2012. I certainly hope that is wrong. I think Obama will win in Texas, and if so Hillary should step down even if she pulls off a victory in Ohio. Ohio can be a face saver for Hillary, but it won’t be enough to keep her afloat for the rest of the campaign. Hillary blew this race on Super Tuesday when she decided to coast along on her victories in New York and California while overlooking the fact that Obama was sweeping the floor with her everywhere else. Vince over at Capitol Annex has his weekly Texas Progressive Alliance Blog Round-Up for this past week. So to make up for this regular oversight, I’ve decided to set up the informal San Antonio Progressive Bloggers Alliance Round-Up to highlight all the good bloggy stuff coming out of the Alamo City that is regularly ignored by our progressive brethrens in Austin, Houston and Dallas. Peter at B&B was able to attend the Barack Obama rally in San Antonio on Friday and gives his thoughts here. He even provides some photos from his seat up in the nosebleed section. Earlier, Peter, a native Chicagoan, had an excellent post about the similarities between the Obama campaign and that of the late Harold Washington, the former mayor of Chicago. Over at Beginning To Wonder, AnnPW has a suggested theme song for the Obama campaign. Donna at Happiness Anyway has a good post up about the astounding number of people we keep locked up in jail for non-violent crimes. It is a huge problem that flies below the radar screen for most people until one of their relatives gets caught up in the system. Karen Zipdrive at Pulp Friction makes the excellent point that we would not bat an eye if John McCain were to pick a white male as his running mate. However, if Hillary Clinton were to pick a white woman for a VP or Barack Obama were to pick a black man, chaos and mayem would ensue. Go figure. Dig ad veritas at Dig Deeper Texas is concerned that the harsh tone of the Democratic primary could hurt the winner’s chances in November. And over at Agblogistan they are wondering if we will see any last minute surprise attacks thrown out just before the March 4 primary. Finally, over at Rhetoric & Rhythm, Mike discusses the Hagee-Farrakhan double standard where Obama is forced to denounce a controversial black minister he has no connection to, while McCain openly embraces the endorsement of a controversial white pastor with no negative consequences. Check back next week for more good stuff from the SAPBA!